All private hospitals and nursing homes remained closed today as doctors went on a strike in protest against the arrest of a local doctor on a charge of doctoring a medico-legal report to show grievous injury to a person involved in a fight. After subjecting schoolteachers to tests, the state Education Department has initiated a “learning outcome test” to evaluate the standard of education in government schools. The state government has said all farmers owning land up to 2 acres or more will be eligible for a government job in case 75 per cent of the their land is acquired. A man who fell on the ground while walking on a road kept struggling for life for over an hour on the national highway in the heart of the town. Identifying climate change, shrinking landholdings and soil degradation as major constraints in meeting the challenge of providing foodgrains to the ever-increasing population, the Director-General, IRRI, Philippines, Dr Robert S Zeigler, and the Director-General of the CIMMYT, Mexico, Dr Thomas Lumpkin, have emphasised the need for intensive and effective research for increasing the foodgrain production. Acting on a complaint regarding two grievously injured children not being admitted to the government hospital in Hisar, the National Human Rights Commission has issued a notice to the Haryana government through its Chief Secretary, seeking a report on the matter within four weeks. A man allegedly chopped his 85-year-old father’s arms, legs and even his private parts in Siwan village here yesterday. The victim, who was bleeding profusely, was rushed to a muti-speciality hospital here and later referred to the PGI, Chandigarh. A jail inmate allegedly committed suicide by hanging himself from the door of the bathroom in the district jail here today. The jail authorities found his body hanging in the morning. Two members of a marriage party, including a brother of the bridegroom, were killed when the car they were travelling in collided head-on with a crane near Yakubpur village here late last night. The deceased have been identified as Pradeep of Kirduad village and Sandeep of Sulaudha village here. The police has registered a case against the driver of the crane in this regard. The doctors gathered at Krantimaan Park here this morning under the aegis of the Hisar branch of the Indian Medical Association. The doctors said the district police had registered cases on similar charges against many doctors without proper investigations. They said under an apex court ruling, the police was required to appoint a panel of experts to determine whether a complaint against a doctor had any basis. The doctors decided to continue their strike indefinitely till the release of the doctor arrested by the police yesterday. They will close outpatient departments and shift the indoor patients to the local General Hospital. They demanded that in the future no arrest should be made till the expert panel gave its opinion and the doctor should be interrogated at the hospital concerned and not in a police station. Dr R Kumar of the local Medicity Hospital, a neurosurgeon, was arrested on Friday and produced in a local court which remanded him in police custody for two days. The FIR had been registered on a charge of fabricating a medico-legal report (MLR) by showing a medically harmless yet legally serious head injury to a person involved in a fight some days earlier to enable him to file a criminal case under Section 307 of the IPC. The fabricated MLR was allegedly prepared in February last year. Dr Kumar’s physiotherapist was alleged to have played the role of a middleman between the doctor and the person. The case was registered after the complainant, Mukesh Kumar, got his statement recorded under Section 164 of the CrPC in the presence of a magistrate. In the first experiment of its kind, the teaching standards were evaluated on the basis of the performance of children in surprise tests conducted in a school in Barwala (Panchkula). Sources maintain that teachers of various subjects and different classes were asked to reach the department’s DIET centre in Sector 2, Panchkula, from where they were to be taken to an unknown destination. With only the top brass of the department in the knowhow of things, these teachers were given no indication of their agenda for the day. At the DIET centre, they were asked to switch off their mobiles and board a bus which took them to Government Senior Secondary School, Barwala. The sources said on arriving at the school these teachers were asked to frame a questionnaire to test the learning skills of the children. Each teacher prepared a paper comprising five questions each and the students were given 30 minutes to complete the test. Later, these test papers were evaluated by the “imported” teachers while the staff of the school was kept away from the entire exercise. The sources maintained that while 80 per cent children, from Class I to XII, failed in the surprise test, hardly 5 to 10 per cent students managed to get more than 50 per cent marks in the test, which was essentially objective. “The idea of keeping the regular staff of the school out of the exercise was to evaluate their teaching skills. The mission was kept a surprise because we wanted a true picture of how much the children were really grasping in their classes,” the Director, Secondary Education, Vijender Singh, said, adding that such surprise tests would now become a regular feature to gauge the standard of education in government schools. However, the teaching community has not taken too kindly to the exercise. The president of the Teachers Association, Kitab Singh Mor, said the department was unjustified in herding teachers to “unknown destinations”. “The teachers are rebuked and insulted during these visits. This is not justified. The department is forcing us to unite against this move.,” Mor said. Kin of such farmers will also be given preference while imparting training in various skills, besides the compensation and annual royalty in lieu of the land acquisition. The farmers, whose land is acquired, will also get full rebate in the stamp duty and registration fee for purchasing land of an equivalent value elsewhere in the state, besides the allotment of a residential plot in a HUDA sector. Stating this, a spokesperson for the government said here today that these facilities were provided in the new land acquisition policy that had come into force on September 7, 2010. He said industrial training would be given to those persons who had no agricultural land and were dependent on farming, but were rendered jobless due to the land acquisition by any of the government agency. The district authorities had been directed to implement the orders of the state government to allow full rebate in the stamp duty and registration fee on the land purchased by farmers elsewhere. However, the rebate would not be more than the cost of the land acquired. This would be applicable on all transactions after September 7 last, claimed the district authorities. As per the revised policy, the state government has announced to pay Rs 25 lakh per acre instead of Rs 16 lakh earlier in the villages, which had been included in the developed (controlled) zones. An additional incentive ranging from 5 to 7 lakh would also be given to the beneficiaries in case they accept the award without any litigation. The land acquisition rate in undeveloped areas would be Rs 20 lakh per acre, claimed the officials. Following protests by farmers, the government has announced a compensation of Rs 45 lakh per acre in Kheri Sadh and Kharawar, Rs 30 lakh in Baliyana and Rs 50 lakh each in Garhi Sampla and Sampla villages. Repeated telephonic calls made on 102 by shopkeepers and passersby to call an ambulance from the local general hospital failed to evoke any response for over an hour. People stopped, watched him gasping for life and left for their destinations. Some did call the ambulance service and also informed the police about the incident. Hans Raj, a Congress worker, who has his shop near Ambedkar Chowk where the incident occurred, said he called the ambulance service from his mobile phone, but to no avail. Finally, two cops arrived there and looked for a vehicle to shift the man. By the time they could arrange a four-wheeler, it was too late. The police shifted him to the general hospital, where he was declared brought dead. The cause of death is yet to be ascertained. The victim was later identified as Ram Dayal, a resident of Dhabi Khurd. Ironically, the Haryana government had started the “Haryana Swasthya Vahan Sewa” with much fanfare in November 2009. The government had purchased 319 new ambulances and distributed these among all the 21 districts for providing the ambulance service to the people. While launching the service, the government had said 100 more ambulances would be added soon. Under the scheme, the hospital authorities are supposed to provide the ambulance service free of cost in case of accidents, deliveries and for people living below the poverty line (BPL). Dr Naresh Goyal, Senior Medical Officer and in charge of the general hospital, said the patient had died when he was brought to the hospital. On the failure of the hospital authorities to send an ambulance on receiving a call, Dr Goyal maintained that they had only one ambulance and that was already on duty. Identifying climate change, shrinking landholdings and soil degradation as major constraints in meeting the challenge of providing foodgrains to the ever-increasing population, the Director-General, IRRI, Philippines, Dr Robert S Zeigler, and the Director-General of the CIMMYT, Mexico, Dr Thomas Lumpkin, have emphasised the need for intensive and effective research for increasing the foodgrain production and improving the condition of farmers. 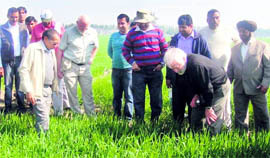 They added that the IRRI and the CIMMYT in consultation with the NARS (National Archives Record Services), India, were carrying out research to improve the factor productivity, breeding of rice, wheat and maize varieties and improved agronomic practices. Appreciating the work done by the IRRI-CSISA (Cereal Systems Initiative for South Asia), Dr Zeigler and Dr Thomas, who visited the CSISA, Haryana, during the past two days to overview agriculture activities and interacted with public-private partners, jointly working for improving the livelihood of farmers, hoped that the programmes launched under the IRRI-CIMMYT would yield desired results. At Taraori village, Dr RK Gupta (South Asia coordinator, CIMMYT) shared his experiences with farmers and discussed various problems being faced by the farmers in adopting new technology. Dr BR Kamboj (CSISA hub coordinator) explained that they demonstrate conservation agriculture (CA)-based technologies to farmers on various sites across the hub focusing on water conservation, labour saving and time management and exposing farmers to long-term CA trials. Dr ML Jat, scientist, CIMMYT, New Delhi, explained about the earlier trials conducted on direct seeding of rice and other resource conservation technologies. The complainant, Baljeet Nayak, president of the Haryana Rajya Manav Adhikar Sangathan, said two children received gunshot wounds in a firing incident in Hisar early this year. The two children - Amit (17) and Sushil (12) - were rushed to the government hospital in Hisar where a medico-legal report was prepared. However, the hospital refused admission to the two children and asked the family members to take them to the PGI. The victim has been identified as Gurcharan Singh (55), a resident of Malkana village of Bathinda district of Punjab. He was serving imprisonment in a case of narcotic trafficking. He was arrested from Kalanwali and the district courts had sentenced him to eight-year rigorous imprisonment and imposed a fine of Rs 80,000. However, in an appeal, the Punjab and Haryana High Court had reduced his sentence to one-year and fine to Rs 10,000. He came out on bail during his appeal before the High Court and had come back to jail to serve the remaining term on February 9. Superintendent of the district jail JS Sethi said the victim had already completed eight and a half months of his one-year term before returning to the jail two days ago and now only three and a half months were left. Judicial Magistrate Abhishek Phutela visited the jail for inquiry. The body was later shifted to the local general hospital for a postmortem. The mishap took place when Pradeep, brother of the bridegroom, along with his friend Sandeep, was coming to Kutani village from Farukhnagar for the marriage. Pradeep reportedly died on the spot while Sandeep sustained serious injuries in the accident. He succumbed to his injuries later.